The 2013 Rolex/FEI World Cup Final came to an exciting yet familiar conclusion Sunday in front of a packed house in the Scandinavum Arena. In the first of two rounds Course Designer Uliano Vezzani tested 23 horse and rider combinations over a demanding track composed of 12 obstacles that did not yield a single clear round. The number of competitors was then whittled to 17 for the 11 obstacle second round with two riders producing flawless efforts. But for a second consecutive year, four rounds would not be enough to determine a champion and again an American and Swiss competitor would jump-off. The United States’ Beezie Madden and Steve Guerdat of Switzerland each ended on a four round total of nine-faults. In a replay of the 2012 Final, Guerdat riding his 2012 Olympic Individual Gold medalist Nino Des Buissonnets, would be forced to jump-off against a U.S. partnership that was known for turning in quick and efficient trips. Last year it was Rich Fellers and Flexible but in 2013 Madden (Cazenovia, NY) and Abigail Wexner’s impressive a 14-year-old Dutch Warmblood gelding Simon were looking to keep the title in the United States. Madden and Simon, the winners of Thursday’s Speed Leg, entered Sunday’s first round on a single fault in second place and were poised to jump a clear round until just rolling the pole coming out of the double at five. Their four fault round was good enough to move them to the head of the field going into round two. In the second round, the pair again jumped a beautiful round only to be marred by a single rail down (11A) and stand on a total of nine faults. Watch Madden’s final round below (begins at 3:30). 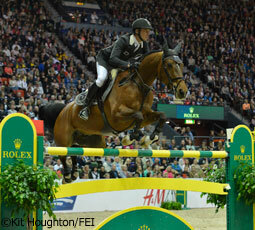 Guerdat was one of two to go clear in Sunday’s second round to also lay on nine faults. The 2012 Final runners-up again entered as the first pair in the jump-off and set a lightening fast pace from the very beginning but faulted at the final two fences. With Madden following him into the jump-off, Guerdat knew that he would need to produce a scorching time if he were to claim top honors. 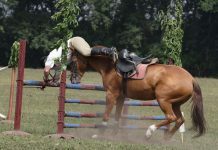 Once she saw that Guerdat had two rails down, the double Olympic Team Gold medalist knew all she had to do was leave all the rails in place and be careful to not exceed the time allowed. Madden and Simon returned to the arena for a final time and the hard-trying, careful gelding produced a steady clear to earn the 2013 Rolex/FEI World Cup Final title. “The cards laid out right for me today. Steve made a great jump up on the leaderboard and the door was left open for me in the jump-off,” said Madden. 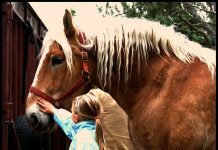 The veteran rider has claimed many of the most prestigious honors in the sport including Team and Individual medals at the Olympic Games, FEI World Equestrian Games and Pan American Games. 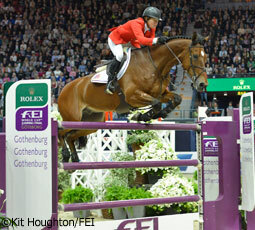 However, a Rolex/FEI World Cup Final title had eluded her until today. Madden was joined by five other Americans in Sunday’s final as McLain Ward, Reed Kessler, Karl Cook, Katie Dinan and Charlie Jayne also completed both rounds. Three-time Olympian, Ward (Brewster, NY) produced a fifth place finish overall with Grant Road Partner LLC’s Super Trooper De Ness on a score of 13 faults. In Sunday’s first round the scopey 11-year-old Belgain Warmblood stallion jumped a near flawless round just adding four faults at the sixth oxer. The pair returned in round two with a podium finish on their mind but were one of many to get caught out in the triple combination adding four faults at 4C. 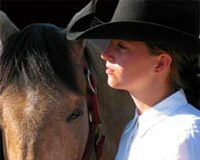 Rounding out the U.S. competitors in the top-ten was 18-year-old Reed Kessler and her 2012 Olympic Games partner the 11-year-old Belgain mare Cylana. Kessler (Lexington, KY) was making her Rolex/FEI World Cup debut this week in Gothenburg and produced an eight fault total in Sunday’s first round after dislodging rails at fences 5B and 9B. In round two, she again incurred eight faults; rolling poles at 4C and 5. Kessler finished in 10th place on 25 faults. Directly behind Kessler in the 11th place was Karl Cook (Woodside, CA) riding Signe Ostby’s 11-year-old Zangerscheide stallion Jonkheer Z to four fault totals in both rounds. They completed their first Final appearance on a score of 28 faults. Completing the U.S. effort were Dinan and Jayne. Riding Grant Road Partners LLC’s 12-year-old Selle Francais gelding Nougat De Vallet, Dinan (Wellington, FL) jumped eight and 12 fault rounds respectively to finish on a score of 38 in 16th place. Like Kessler and Cook, the 19-year-old was also riding in her first Final. Jayne (Elgin, IL) and Alex Jayne and Maura Thatcher’s 10-year-old Zangerscheide stallion Chill R Z produced an eight fault trip in round one. But 20 faults in the second round left the 2012 Olympic reserve combination in 17th place on 44 faults. Kent Farrington (Wellington, FL) also qualified to represent the United States in Sunday’s final but chose to save R.C.G. Farm’s Uceko for another day. Chef d’Equipe Robert Ridland was pleased with the results of all the U.S. combinations this week. Way to go Beezie Madden!